The web in Iran has emerged as a source of information for voters, who are choosing a new president in a run-off election. And the authorities are increasingly tightening controls over the net, says a study out this week. The report on internet filtering in Iran was written by The OpenNet Initiative, a partnership of researchers in the US, Britain and Canada. The bulk of the study's technical work was done by one of the partners, The Citizen Lab at the University of Toronto. Since last November, the Lab has been using computers inside and outside of Iran to determine what kind of content the Iranian government is blocking, and how it is blocking that content. The Lab's Director of Technical Research, Nart Villeneuve, says he and his team tested more than 1,000 web addresses. Some of what they found is not surprising. 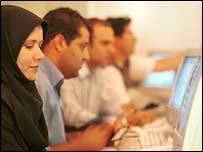 For example, the Iranian government is blocking pornographic sites, and other sites with sexual content. But according to Mr Villeneuve, the Iranian government's filtering goes far beyond that. "Iran is definitely targeting dissident groups," he said. 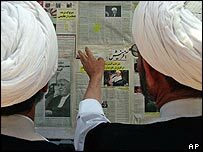 "The Communist Party of Iran, mujahideen groups outside of Iran, sites talking about the monarchy, news outlets like the Voice of America, things like that are being targeted in Iran." The study also notes that weblogs, particularly those in Farsi, are being targeted by the Iranian government, as well as websites that provide tools or tips in how to get around internet filtering. "If you want to block some content and get into the censorship game, then you have to start blocking other avenues users can use to get around it," said Mr Villeneuve. Unlike China, which filters content in a centralised way at the national level, the Iranian government relies on the country's various internet service providers to assist with its censorship. In Iran, those internet service providers are not using sophisticated technology to do this. They are using SmartFilter, commercially available filtering software produced by a US company called Secure Computing. SmartFilter, according to the Secure Computing website, comes with a database of millions of blockable web addresses, in more than 60 categories. Mr Villeneuve said a user, like the Iranian government, can take that commercial list, and then add sites it wants to block for political reasons. "There's a market for censorship technology out there, it's a growing market, and we're seeing it being filled," he said. "There are companies out there that develop these products, and they're being used not only in your local library, or parents trying to protect their children. "We're seeing this same technology used at the country level, used to block web content for political reasons. And that's pretty scary." Secure Computing did not agree to an interview but issued a statement saying that it "has sold no licenses to any entity in Iran," and that use of its software in Iran has been done without its consent. Secure Computing also said it was actively taking steps to stop what it called this illegal use of their products. The company maintains that it is "fully complying with the export laws, policies and regulations of the United States". "I take them at their word,- that they are 'shocked to find gambling going on in this establishment,' to quote from the movie Casablanca," said Jonathan Zittrain co-director of Harvard Law School's Berkman Center for Internet and Society, one of groups who helped write the Iran report. "But the fact remains that the software has been in use for an extended period of time there. And we've seen Secure Computing software turn up in more than just Iran. We've seen it in Saudi Arabia as well," he said. Ultimately, Mr Zittrain said, it is not very productive to single out Secure Computing. He notes that Microsoft took heat recently when it was revealed that its Chinese blogging tool was helping the Chinese government filter words such as democracy and freedom. Companies making filtering software, Mr Zittrain says, now have a chance to stop and think about the way their products are used in countries such as Iran and China. "I think there's a spectrum ranging from providing steel to a regime, to providing them with finished bullets, to providing them with execution services, where at some point you say, 'we're not going to do it'." The OpenNet Initiative's report indicates that Iran's internet filtering regime continues to grow more extensive, more sophisticated, and more precise in its focus on local websites. And that, the report concludes, is sure to keep Iranian web-surfers guessing as to exactly what, on a day-to-day basis, they will be allowed to see. Clark Boyd is technology correspondent for The World, a BBC World Service and WGBH-Boston co-production.